Mountain’s oldest campus was a portable setup in an old high school auditorium with aging systems, and the weekend experience was not living up to that of the other campuses. For the long term viability of the campus, it was critical to move them to a 24/7 location and upgrade to a higher quality, more intentional environment. A church member who owns an 80,000 square feet fitness and recreation center suggested to church leadership that they should use the Arena Club’s field house for weekend services. In order to convince the church it would work, some of the foremost priorities were: talk through intentional lighting that would change the look and feel of the space from a typical gym into a creative environment, how to treat the room acoustically so that a great loudspeaker system and acoustic drums would be successful in the space, and also ensure that video teaching could be a central focus point without distractions. Though weight loads were an initial concern, we knew the field house would still need to be a multi-purpose space, and that we had to develop a system that would stay out of the way during sporting events. The result is a hybrid approach of flown and ground support and a digital, fiber based network for audio, lighting, and video signals control that makes setup and teardown fast and easy. This field house collaboration was a transformation like we’d never seen before, and deploying a full production system into an active fitness club and activity center is extremely challenging logistically. Our team coordinated closely with the club to ensure as minimal of disruption to their activities as possible, while also completing our work on time and within the budget. There had been talk about switching to a live transmission system for years, though it was important to find a solution that kept their team’s focus on volunteer relationships and the service's production quality - not worrying about potential transmission, recording, and playback issues. Guardian SlipStream allowed them to make the transition with minimal training and minimal disruption. As hard as we tried, there was no way around some elements of this system needing to be set up portably every week. Because this campus had been fully portable for a number of years, the church was understandably wanting to minimize the work that would be required weekly from a setup and teardown crew. To help make the process as efficient as possible, Mankin developed a digital, fiber based network for audio, lighting, and video signals and control that makes setup and teardown of both the stage and a portable front of house fast and easy. This project utilizes a Yamaha console system with Dante network, L-Acoustics loudspeaker system, Shure wireless mics and in-ears, Chauvet LED pan/tilt/zoom theatrical lighting fixtures throughout, Jands Vista lighting control, a CreateLED 84 panel LED wall, HP Aruba network backbone, and acoustic treatments by Auralex. One of the coolest features of the production system is it’s ability to actually function in two modes. Setup and connect the portable front of house for audio, theatrical lighting, and video control, and you have full functionality as expected for services. But with the front of house disconnected and packed away, a simple to use self-tech system is enabled to allow the Arena Club staff to use the loudspeaker system for environment music, play a movie from the LED wall, or even connect a laptop for scoreboard or presentation applications! The campus has grown significantly since making the move from the old high school. 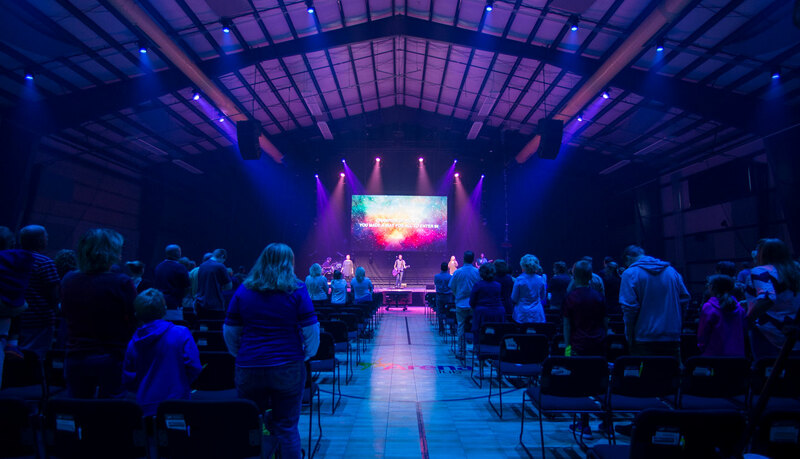 More importantly, the space has already proven it’s value beyond weekend services, equally fit for large multi-campus student worship nights and even showing movies to the Arena Club’s summer campers. As churches expand, a consistent challenge is finding affordable, usable space. This project presents the best possible worship experience that can be created in a mixed use field house, serving as a growth catalyst and incredible tool for the church as they minister to their community.